In the village Kastrosykia of Preveza, close to the central road, there a sign leading us to the monastery of St. Pelagia. It is a well-preserved monastery, as the monks live there until today. It has old and new cells, and there is the church in the centre of it. It is one of the monasteries that financed in the past the schools of the region. The monastery was renovated in 1613 and in 1795. Various Roman ruins are distinguished. From the ruins were stolen many reliefs and placed in the Church, just like the two lions in the entrance. 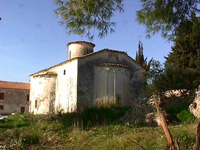 The Church is unplastered, built by flint with three spaces, basilica with dome. The High Altar is based on an old stand and on the columns of the dome are distinguished korinthian caps and an ionic base.